Philadelphia, PA — Late-term abortionist Kermit Gosnell and eight of his co-defendants were arraigned yesterday for the murders of one abortion patient and seven new born babies along with a host of other charges. Below are their mug shots and a summary of their charges. To read the full official list and explanation of charges, click here. To view graphic photos of the murder victims, click here. KERMIT GOSNELL, 69, Bail Amount: No Bail. Gosnell is considered the man in charge with the most culpability. He is charged with 39 counts including 3rd degree Murder in the death of Karnamaya Mongar, 7 counts of Murder for killing seven living infants after birth, Abuse of Corpse, Tampering with Evidence, Corruption, Conspiracy, Obstruction, Racketeering, and Solicitation for Murder (Baby G), and more. ADRIENNE MOTON, 33, Bail Amount: No Bail. Moton is an unlicensed worker with no medical background. She administered anesthesia and committed other illegal acts, including “snipping” a procedure where live newborn infants were murdered by cutting their spinal cords with scissors. She is charged with Murder (Baby D), 2 counts of Conspiracy to murder, Racketeering, and Conspiracy related to corruption. LYNDA WILLIAMS, 42, Bail Amount: No Bail. Williams is an unlicensed worker who committed illegal abortions, administered anesthesia, and committed other illegal acts. She is charged with 3rd degree Murder in the death of Karnamaya Mongar, Murder (drug delivery), 2 counts of violating the Controlled Substances Act, Murder (Baby C), 2 Counts of Conspiracy to murder, Illegal late-term abortions, Conspiracy related to illegal abortions, Racketeering, and Conspiracy related to corruption. STEVEN MASSOF, 48, Bail Amount: No Bail. Massof was an unlicensed medical school graduate who worked as an abortionist at Gosnell’s clinic. He is charged with Murder (Baby F and Baby G), Conspiracy to murder, violations of the Controlled Substances Act, Theft by deception, Racketeering, and conspiracy related to corruption. SHERRY WEST, 51, Bail Amount: $2 million. West was an unlicensed worker. She committed illegal abortions, administered anesthesia, and dispensed drugs illegally. She is charged with: 3rd degree Murder in the death of Karnamaya Mongar, 2 counts of violating the Controlled Substances Act, 5 counts of Conspiracy (related to murder, illegal drugs, and corruption), Murder (Baby C.), Illegal Abortions, and 1 count Racketeering. 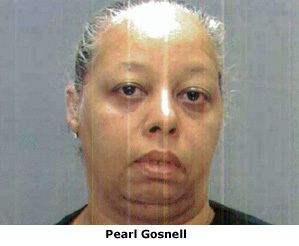 PEARL GOSNELL, 49, Bail Amount: $1 million. Gosnell is the wife of abortionist Kermit Gosnell who worked frequently at his clinic, especially on days that illegal and very late abortions were done that her husband did not want the other workers to witness. She is charged with Illegal late-term abortions, and two counts of conspiracy related to illegal abortions and corruption. EILEEN O’NEILL, 54, Bail Amount: $1 million. O’Neill is a medical school graduate but had no license or certification. She masqueraded as a licensed physician. She is charged with 9 counts of theft by Deception, Conspiracy to commit theft, Racketeering, Conspiracy related to corruption, Perjury, and False Swearing. ELIZABETH HAMPTON, 51, Bail Amount: $250,000. Hampton is Gosnell’s sister-in-law. She is charged with Obstruction, Hindering Apprehension or Prosecution, Perjury, and False Swearing. MADDLINE JOE, 53, Bail Amount: $250,000. Joe worked as the office manager for Gosnell’s mill. She is charged with one count of conspiracy related to corruption.